One of the best pastimes and major hobbies around the globe revolves around card games. These can be conveniently played indoors either by one self or as a group among family members within the family or friends from outside. The long list of card games provide a forum to interact with friends more often than not, and even in making new friends and acquaintances when expanding one’s circle of influence. There is no age limit for playing card games – but older and retired people find it an opportunity to while away their time by inviting friends or visiting friends for playing card games and having a jolly good time. As I said before, the card games range from a variety of options of playing; singly, in pairs, in fours or may be in some cases more. But normally the card games are restricted to at best four people, pairing in twos. But the best of the pastime is the famous Solitaire, which is for those who are living alone and still have access to an absorbing and challenging game. While it is worthwhile to play it with actual cards, the games comes in-built in almost all OSs on the computer. 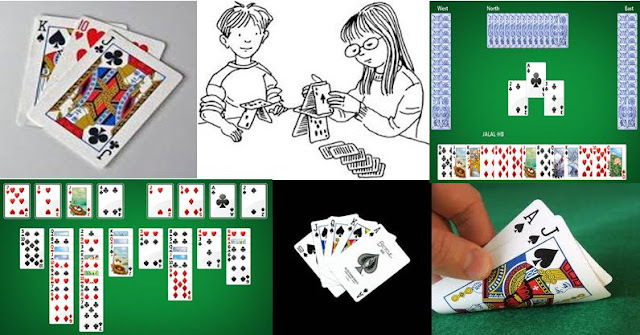 Another games which is popular in individuals is the FreeCell. This also comes built in Windows and is my favourite pastime. The games involving two or four persons have a wide variety. Most famous and largely played games include the bridge, poker, rummy, Euchre and many more. Bridge is for very serious players, while poker is generally played to make money. Al these games are available on-line n internet and can be played with remote partners. The cards games are also popular in children, who have wide variety of games to play with friends of own age. One of the most likeable games is matching game, wherein the players try to group the matching cards in order to beat the others. One play tricks with cards too, which involves winning tricks. The accumulating game or the “bank” is collecting most of the cards, and the winner is the one who at the end of the game as maximum booty collected. Making a house of cards, just like a sand house on the beeches, is also popular among children. Though, after the second row, it is a grown ups domain. Another game which is popular among all ages is the “Hearts.” Played between four players, the game is very challenging and the player with least point wins the game. The game is also known as the Black Queen, as the queen of spade carries a score of 12 and the remaining cards of hearts carry one point each. So one has to try not to get the black queen or the queen of spade and resist getting cards of hearts. Of all the card games, Poker has the maximum number of varieties. These include 7 Card Stud Poker, 2-7 Triple Draw Poker, 7 Card Stud Hi Lo Poker, 7 Card Stud Poker, 8 Game Mix Poker, Free roll Poker, Horse Poker, Omaha High Poker and many more. These games are also available on line and are favoured the world over. As for the history of card games which dates back to the 10th century, China is usually credited with the creation of playing cards. Some consider that the game of dominos was a cue for the foundation of playing card games and that is the reason that we still find Chinese figures on the playing cards. These then spread through the Middle East to the Europe, where it became increasingly popular by 14th century, specially in France. And from here the four suit games travelled to the UK and then to America. Poker is generally considered to be the brainchild of the Americans, while the genesis of Bridge are traced back to England and France. We will talk of individual card games more in coming posts and see how popular are these games among people around the world.